With the DC Comics Dice Masters: Mystics Team Pack, youll be rolling dice with the power of Zeus! 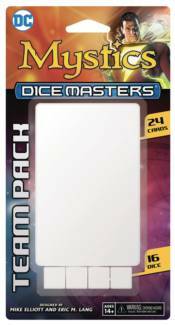 The DC Comics Dice Masters: Mystics Team Pack features both Shazam! and his foe, the tyrannical Black Adam. Shazam! isn't without help though, since both Captain Marvel Jr. and Mary Marvel are in the mix. Who knows what will happen when you add these to your team its practically an entire house-worth of mystery. The DC Comics Dice Masters: Mystics Team Pack is perfect for the Dice Masters veteran or someone looking to jump into the game fresh. With 24 cards and 16 dice, this release will bring untold mysticism directly to your Dice Masters games!